1 of 4 Spread chicken onto a large cutting board. 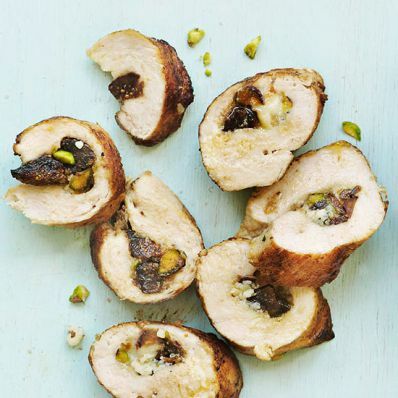 In a medium bowl, stir together blue cheese, dried figs and pistachios. 2 of 4 Spoon 1 to 2 tablespoons filling onto center of each piece of chicken, compacting slightly. Roll chicken around filling to enclose completely. Secure with a toothpick. 3 of 4 Season chicken with salt and pepper. Heat butter and oil in a large, lidded stainless skillet over medium-high heat. Add chicken and cook 4 minutes without turning. Carefully flip over and cook, covered, an additional 4 to 5 minutes, until internal temperature registers 165 degrees F.
4 of 4 Remove chicken to a clean cutting board and remove toothpicks. Slice on a slight diagonal and serve with salad greens, if desired. Per Serving: 5 g sat. fat, 2 g fiber, 44 g pro., 13 g carb., 15 g Fat, total, 115 mg chol., 414 mg sodium, 368 kcal cal.